The Laurier men’s soccer team battled with the McMaster Marauders on Friday. 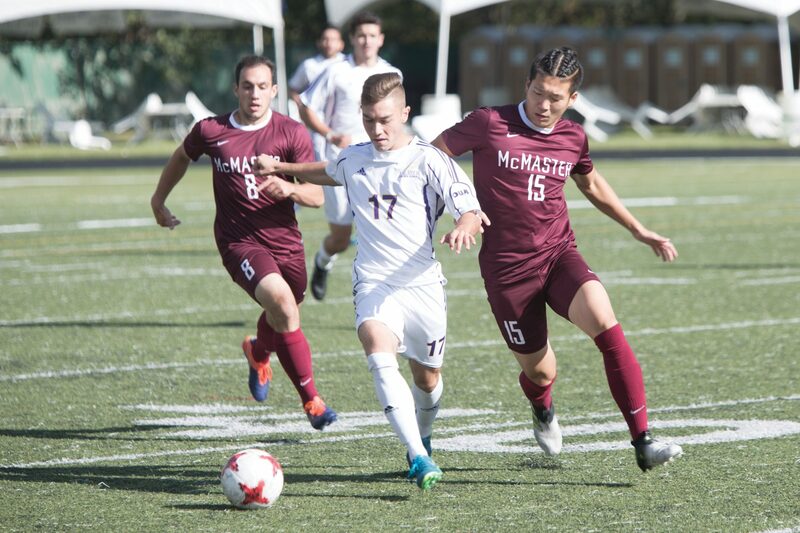 The game ended with a late goal by McMaster resulting in a disappointing tie for Laurier. Coming off a two game win streak, the Hawks played Friday’s game with competitive confidence. Laurier opted to play the first half of the match running against the wind for the chance to work with the wind in the end. Even with this disadvantage, Laurier applied strong pressure to the McMaster defence and earned several scoring chances due to winning one on one foot battles. McMaster opened the scoring with a quick goal to take the lead in the first 15 minutes. Laurier’s offensive play was a strong response to the McMaster goal; creating several scoring chances and a strike that went off the post. Mid way through the first half, the game reached a stalemate. Both teams played a smart passing game to control play and work toward a scoring chance. Finally, near the end of the first half, Laurier capitalized on a penalty kick to tie the game up going into the break. However, the Marauders came out of the break with a new found energy. Laurier repelled the McMaster advances and took the lead just 10 minutes into the second half. Another tough call from the referee gave McMaster the ability to tie up the game in another penalty kick. The rest of the half was a flurry of activity, both teams determined to carve out a win. In the end a victor couldn’t be decided. Despite Laurier doubling McMasters shots on net, the teams went their own way splitting the two points. McMaster being when of the better teams in their division, Coach Halapir was pleased with Laurier’s effort. Author: Garrison OosterhofGarrison is returning for a third year with The Cord and for a second year as Web Director. Garrison manages The Cord online but also likes helping out with photography, videography and by writing articles. Garrison has a passion for building community and creative storytelling.